Artistic collaboration has always been a key issue for rock music. Armed with the ability to create music in home studios and then to exchange tracks via internet, rock musicians began to experiment with new, more complex forms of artistic interaction. Ilya Lipkin (of THE RE-STONED) and brothers Ark and Ivan Fedotov (both of VESPERO) first met on stage in Moscow in 2013 during the Vespero’s tour: Ilya made guest appearance at one of the band’s gig. Ark, Ivan and Ilya were attracted to something in the others, and started to exchange their musical views and ideas through the web. In December 2014, Ilya was invited to Astrakhan, a hometown of Ark and Ivan to try new tunes by the three on stage. That memorable concert was a total public success, and a new band was born – instrumental psychedelic-space-rock trio MAAT LANDER featuring Ilya Lipkin (guitars), Ark Fedotov (bass, keys, synths), and Ivan Fedotov (drums, percussions). Follow MAAT LANDER on Facebook. 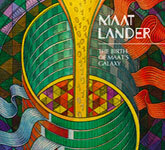 "The Birth Of Maat's Galaxy" is a debut album of the band called MAAT LANDER. It presents instrumental sci-fi rock-music that is all played live and not programmed although a variety of electronica influences – ranging from ambient to experimental kraut – assert themselves. It’s not necessary innovative but always interesting and enjoyable work with a sense of adventure; arguably, rather different from what the musicians do in their mother-bands – VESPERO and THE RE-STONED. Mixed by Ilya Lipkin; mastered by Tobias Svensson. Original graphics by Alexander Zhelonkin. (10 tracks – 74 min.). Free streaming or immediate digital download of the album (MP3, FLAC or other formats) is available through Official R.A.I.G. Bandcamp. "Imagine Ozric Tentacles at lesser speed and less techno, then you're almost there. Added to the mix are some Tangerine Dream references and early Pink Floyd space resemblances." – by Raimond Fischbach at SFTW (UK) (May 2015). "This 10 track set is a winner from start to finish… The Comet Rider opens, featuring totally cosmic, tightly wound Space Rock performed with a high level of musicianship like a combination of Vespero, Ozric Tentacles, Hidria Spacefolk, Oresund Space Collective and Korai Orom. Alnilam is an alien ethno-trance blend of mandola, ethnic percussion, soundscapes and oodles of sci-fi effects. Maat Lander inject a pounding rave worthy rhythmic pulse into Spiral Arms, which rocks hard and includes killer ripping and screaming guitar. To Johannes Kepler and Gliese 581 are both beautifully atmospheric and cosmically haunting excursions that you can float and groove along with. Two Keys To The Sky is similar and includes some Bluesy Dave Gilmour-ish guitar. Aquarius is a high energy and sometimes whimsical blend of Space-Prog, Jazz Fusion, the Ozrics at their most rocking, and spaced out atmospherics. Lunar Rocket blasts off the launching pad for some powerhouse Space-Prog with seductively melodic but also dirty rocking guitar solos and a frantically swirling stew of space electronics. Coma Berenices starts off with a combination of sequenced synths, falling star electronic effects, steadily potent drumming, Prog guitar soloing and soundscape guitar, but then bursts into the stratosphere as an in-yer-face, heavy duty Space Rock blast, while always retaining an overall atmospheric feel. Finally, the title track is an electronic heavy track that’s a steadily grooving and melodic jaunt through the cosmos. It’s got some cool Bluesy jamming guitar and classic Prog keys too… Fans of instrumental Space Rock and rhythmic atmospheric explorations played by smokin’ hot, creative musicians should drop whatever they are doing and get this NOW. Highest recommendation!" – by Jerry Kranitz at Aural Innovations (USA) (June 2015). "After one listen to the trio's debut effort The Birth Of Maat's Galaxy, which comes housed in a beautifully designed digipak, you don't need to be a genius to figure out what brought these musicians together for this exciting new musical venture. The Fedotov brothers supply an endless amount of electronic bliss and trippy space rock passages, highlighted by gorgeous synth textures, layered overtop the muscular percussive patterns, while Lipkin's varied guitar work goes from all out scorching blues fused solos to carefully thought out, multi-faceted soundscapes. Blended together it all comes across as one long seamless composition, even though there are ten individual tracks. It's an almost eighty minute journey that will have the listener hooked from the opening atmospheric introduction of 'The Comet Rider' through to the final closing notes of the epic sounding title track. This is a simply stunning debut effort from Maat Lander that unites three supremely talented musicians and has given them the opportunity to forge a truly unique listening experience. If you're already familiar with Vespero and The Re-Stoned, then I can't see you passing this one up. Even if you're not, you're still definitely going to want to check this one out. Highly recommended! (Score: 5 out of 5)" – by Ryan Sparks at Sea Of Tranquility (USA) (June 2015). More reviews: Musikreviews.de (Germany), PleniRockIum (Italy), New Underground Music (The Netherlands), Dayz Of Purple And Orange (UK), Autopoietican (Peru), iO Pages (The Netherlands), Babyblauen Seiten (Germany), DPRP (UK).